Paul Witherspoon, 21, and his 22-year-old girlfriend, Stephanie Washington, who was wounded in the police shooting, were stopped in New Haven Connecticut on April 16. Daily Mail. Thu, 25 Apr 2019 23:38:38 GMT. ABC News. Thu, 25 Apr 2019 15:57:28 -0400. CNBC. Thu, 25 Apr 2019 17:20 GMT. The American Lung Association has released its annual "State of the Air" report. You will not like Connecticut's grade. Brian Mccready. Patch. Wed, 24 Apr 2019 16:26:55 -0400. ABC News. Wed, 24 Apr 2019 13:21:20 -0400. A panel of 15 coaches voted on the top high school girls lacrosse teams in Connecticut. Tim Jensen. Patch. Wed, 24 Apr 2019 13:07:27 -0400. By Lisa Backus. Connecticut Post. Wed, 24 Apr 2019 10:48:47 UTC. HARTFORD, Conn. & BOSTON - Eversource will webcast a conference call on May 2, 2019, at 9 a.m. EDT to discuss the company&apos;s performance through the first quarter of 2019.
Business Wire. Mon, 22 Apr 2019 14:00:00 UTC. Michele Debczak. Mental Floss. Mon, 22 Apr 2019 09:00:00 -0400. Parents in Connecticut have filed a lawsuit against Cheshire Academy alleging that their son, Michael Mancini, was expelled from the school due to his conservative views, The Hill reported on Sunday. Newsmax. Sun, 21 Apr 2019 20:28:01 EDT. Austin Danforth, Burlington Free Press. Burlington Free Press. Fri, 19 Apr 2019 19:18:12 -0400. KETV - Omaha, Nebraska. Fri, 19 Apr 2019 03:05:00 GMT. According to the 2010 census, the population of Connecticut was 3,574,097. In 2008, the estimated population of Connecticut was 3,501,252, whereas in 2006, the population of Connecticut was about 3,487,896. For detailed, up-to-date information about Connecticut's demographics, visit the U.S. Census Bureau's QuickFacts about Connecticut web page. For maps of Connecticut, visit this Connecticut Map website. 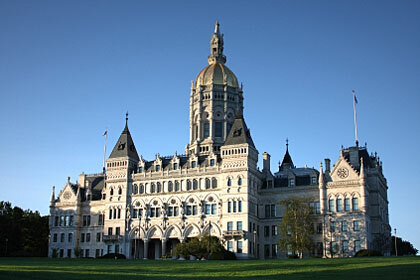 The photograph above shows the state capitol building in Hartford, Connecticut. Connecticut newspaper publishers are listed here, along with their addresses, phone numbers, and website links; Connecticut library names, descriptions, and website links are listed on this page. More information about Connecticut can be found here.